HIV “piggy-backs” on infected CD4 T cells! A research study by scientists from Massachusetts General Hospital (MGH) has shown that, not only does HIV infect and destroy CD4 T cells, but also appears to use those cells to travel through the body and infect other CD4 T cells. In this study which is the first to visualize the behavior of HIV-infected human T cells within a lymph node of a live animal, using a recently developed "humanized" mouse model of HIV infection, the researchers have found that HIV disseminates in the body of an infected individual by 'hitching a ride' on the T cells it infects. 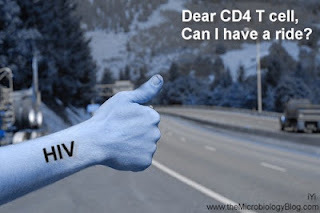 As the Infected T cells continue to migrate within and between tissues such as lymph nodes, HIV gets a ride to remote locations that are usually not accessible to free viruses. The scientists used the humanized BLT mouse model for their experiments, the only non-primate that can be infected with HIV. Upon confirming that human T cells enter and normally migrate within the animals' lymph nodes, the researchers injected the animals with HIV that is engineered to express green fluorescent protein (GFP), to track the movement of infected cells within living animals using intravital microscopy. They first observed that, within two days, infected T cells continued to migrate and were uniformly distributed within lymph nodes but remained in nodes closest to the site of injection. As the HIV-infected cells actively moved within lymph nodes, they did not move as quickly as comparable but uninfected T cells. Moreover, about 10 to 20% of the HIV-infected T cells formed abnormally long and thin extensions that appeared to trail behind moving cells, often exhibiting branches. The researchers thus hypothesized that the HIV envelope protein, expressed on the surface of infected T cells before they release new virus particles, might cause infected cells to form tethering contacts with uninfected cells, causing these extensions. A series of experiments verified that the elongated shape of some infected cells requires the presence of the envelope protein and that many of the elongated cells contained multiple nuclei, suggesting they had been formed by the fusion of several cells. Further, to test the role of T cell migration in HIV infection, the researchers injected another group of BLT mice with HIV and at the same time treated them with an agent that prevents T cells from leaving lymph nodes. Two months later, levels of HIV in the bloodstream and in lymph nodes distant from the site of injection were much lower than in untreated HIV-infected animals, supporting the importance of T cell migration to carry virus throughout the body. Treatment with the migration-suppressing agent, however, did not reduce viral levels in animals with already established HIV infection. While this observation of tethering interactions between infected and uninfected CD4-expressing cells suggest that HIV may be transmitted between T cells by direct contact, further future studies are needed to explore further and to investigate previously unexplored aspects of HIV pathogenesis. 1. HIV Disease progression - Genetic fossils show way!